Visits to our nation’s treasures, the U.S. National Parks, connect people with nature and history. Personally, they wake me up far better than a double espresso. They fill my soul with wonder and appreciation. A recent trip to the Grand Canyon became a glorious getaway and certainly ranked as one of my best. 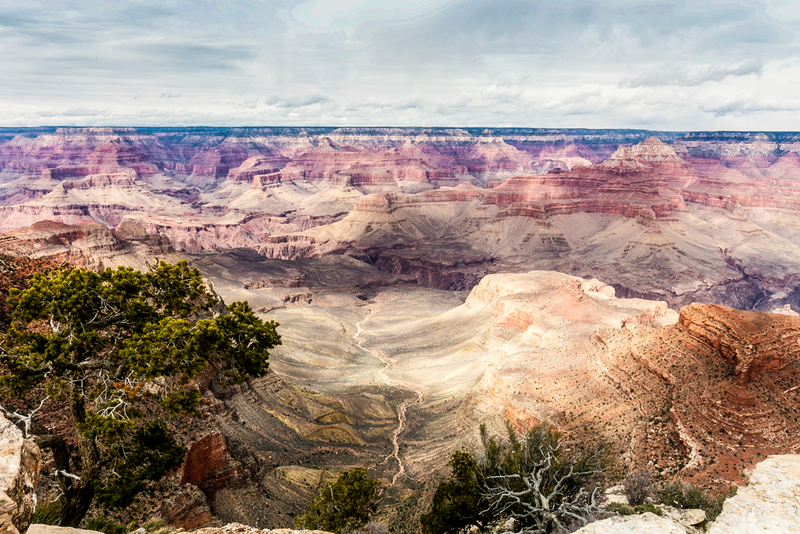 The view from the South Rim declares and defines nature’s power and beauty about as profoundly as possible. Trust me, no one leaves disappointed. 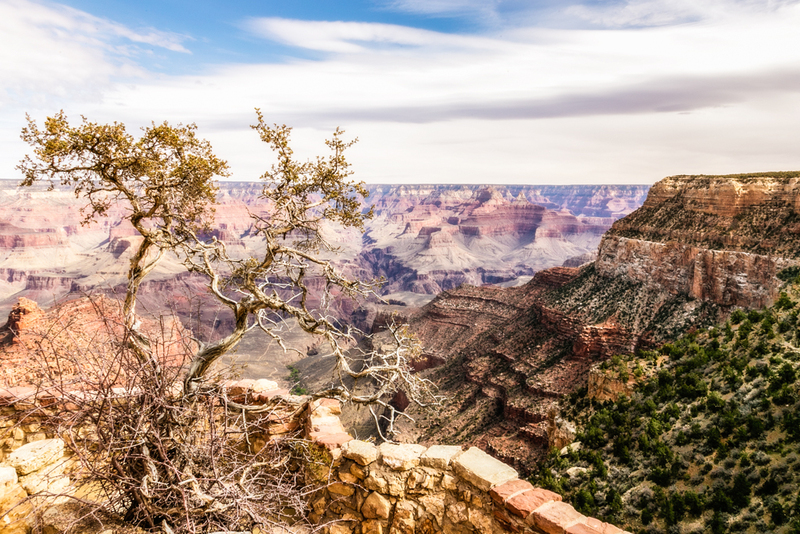 The carving of the Grand Canyon by the Colorado River has taken place over the last six million years, exposing rocks at the bottom of the park that are close to two billion years old. 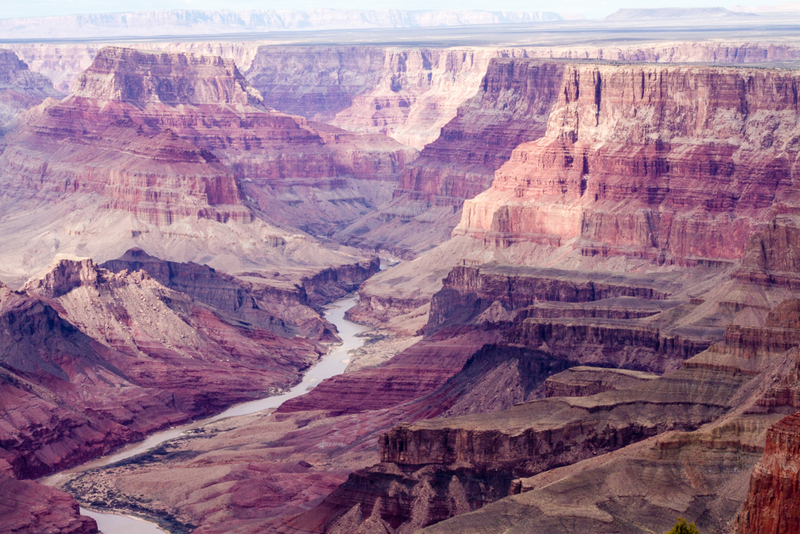 The Canyon runs 277 river miles, and the distance across the rim spans ten to 18 miles. The great gorge, declared a National Park in 1919, rightfully attracts about 4.5 million visitors each year and even those on a limited budget can manage. But, if upscale travel is more your style, then follow me. Imagine stepping back in time and arriving at the Grand Canyon the same way travelers did more than 100 years ago- on the iron horse. Start by driving to Williams, Arizona, a frontier “Main Street” town along legendary Route 66. Williams retains much original architecture and road-side appeal from the era when car travel was king and roadside cafes dotted the rural towns along the drive. 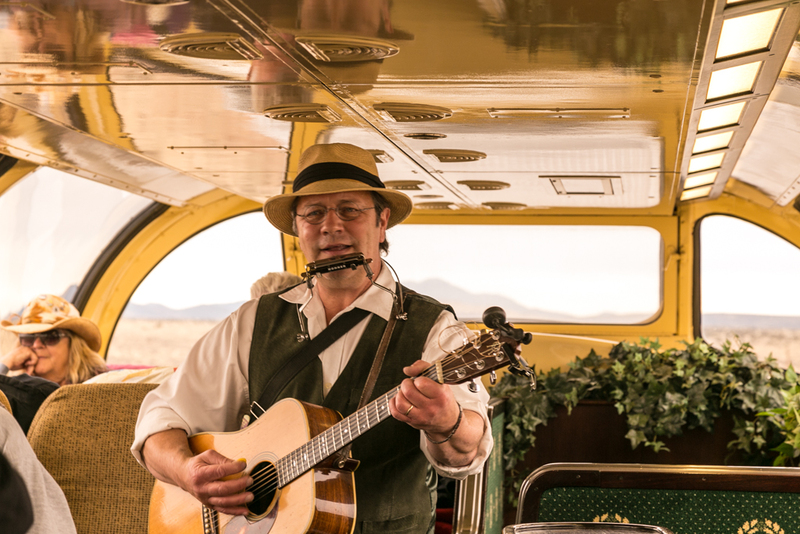 Check into the Grand Canyon Railway Hotel, which offers packaged deals from Xanterra, the park’s concessioners, for lodging both in Williams and the national park, as well as transportation aboard the vintage railroad. Arrive in time to explore the town and perhaps dine at Spencer’s Pub in the hotel. When you retire, you will sleep on a wonderfully comfortable bed, a perk always appreciated by travelers. In the morning, simply leave your bags outside your door. Luggage will be transferred to your room at the Grand Canyon. Breakfast buffet waits at the Grand Depot Cafe with everything desirable, including eggs and pancakes made to order. Every day in Williams begins with a Wild West shootout. Of course, I expected a lot of cheesy humor from a scripted show, but the costumed actors were surprisingly good and the banter was honestly fun. The audience fell into the moment. Afterward, follow the crowd to the diesel-powered train as the conductor barks out, “All-aboard!” First-class tickets provide entry to the “luxury” cars with period furnishings, an attendant to serve food and drinks and no babies or small children. Guests must be 16 years and up for this class of service. Sip your second round of coffee or juice and munch on pastries, as you ride through pine forests and wide open prairies. 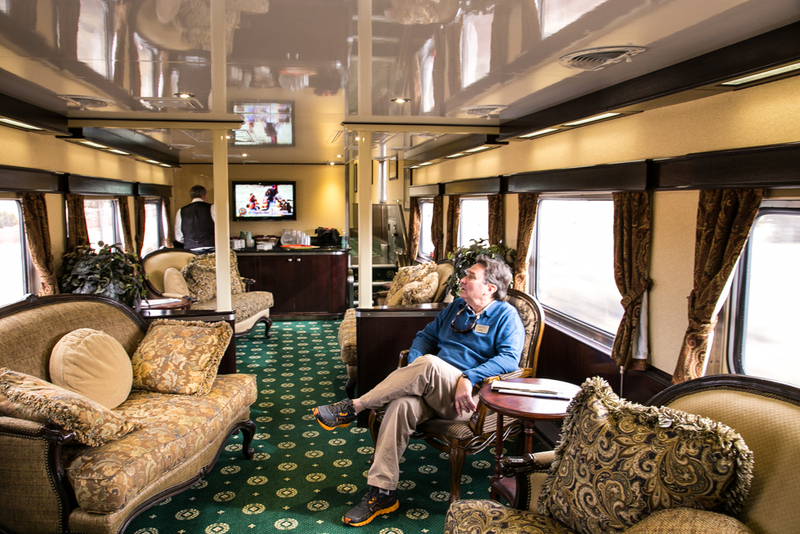 Travelers choose between six distinct classes of service, but the luxury dome car with full length dome windows is the way to go. During the two and half hour ride, musicians stroll between cars playing banjo and western tunes. You can also venture from car to car and stand on the rear platform to capture some round-the-bend train pics. 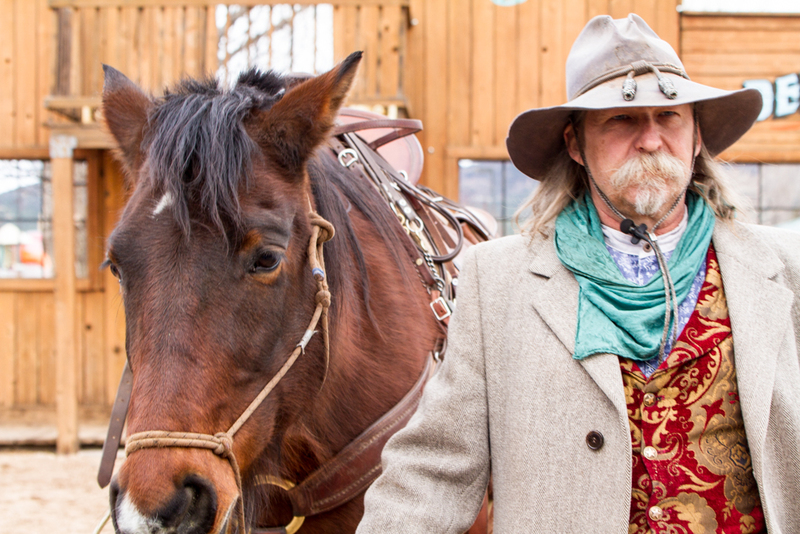 Before this railroad opened for business in 1901, visitors rode a four-horse-team stagecoach. Tickets cost $20 for that arduous bumpy ride, compared to $3.95 for the new-fangled choo-choo. No wonder steam powered trains became the desired choice of public transport. However, as automobiles grew in popularity, rail travel slowly dwindled. In 1968, the tracks went quiet and lay dormant for twenty more years. Then, in 1989, the line was renovated, providing children and adults an opportunity to savor a most romantic mode of travel. The sojourn ends in front of the log-framed Grand Canyon Depot. In 1905, the Santa Fe Railway built the El Tovar Hotel just up the hill and turned management over to the Fred Harvey Company. El Tovar reigned as one of the most luxurious hotels of its day, featuring hot and cold running water, electric lights, art galleries and plush dining rooms. The original dark timbered structure still beckons. 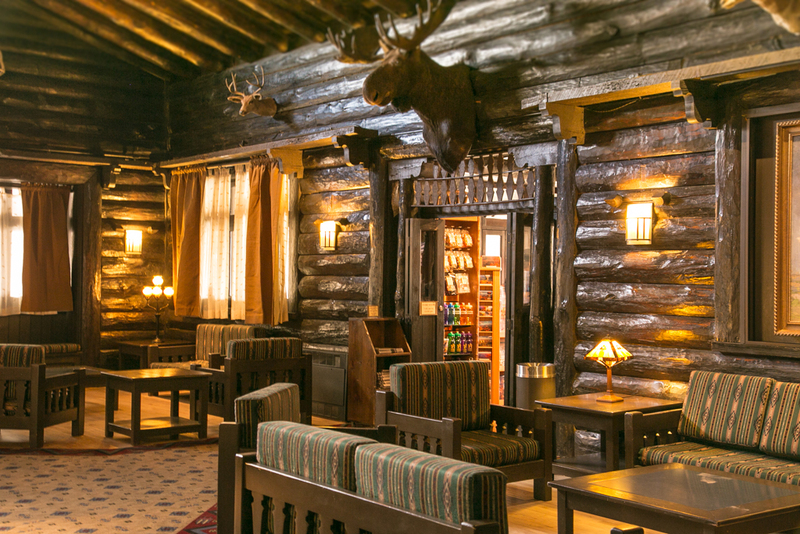 Enter the dim lobby festooned with moose, deer and buffalo heads, plus large paintings of the Canyon, and feel the past. If you are lucky enough to be staying there or next door at the Thunderbird or Kachina Lodges, you will pick up your key. I stayed in the Kachina Lodge, built with a plain modern exterior, but the rooms inside are totally up to date and the view can’t be topped. Be sure to reserve a room on the Canyon-side so you can look out from dawn till dusk. Being in the Village means you can walk to El Tovar for classic dining or to the excellent Arizona Room at the Bright Angel Lodge. You might try the Canyon Coffee House the next morning, but again I suggest El Tovar. Best southwestern breakfast I have ever been served. 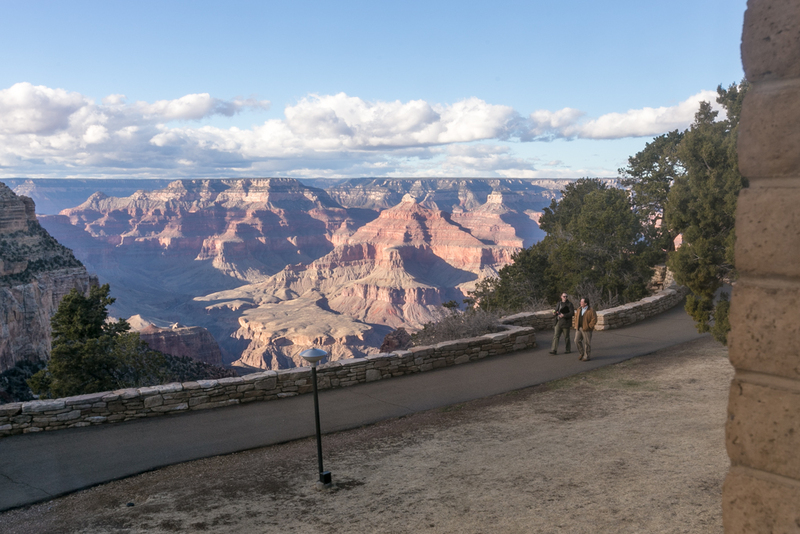 Allow plenty of time to stroll along the the walkways on the rim, shoot photos and selfies and marvel at the panorama. One can never get enough of this spectacle. The striated colors gleam in daylight. They change by the hour and position of the sun and clouds. The Bright Angel History Room in the Bright Angel Lodge displays the uniforms of the Harvey Girls, the famed hostesses of the Fred Harvey Company that managed so many of the train restaurants and hotels. You can also learn about Mary Colter, the famed architect, and see her famed geologic fireplace. Don’t miss the Kolb Brothers Studio, now on the National Register of Historic Places. The Kolb brothers were early canyon photographers who produced a movie of a boat trip they made down the Colorado River in 1911-12. They ran the film daily for 75 years. You can watch their adventurous exploit with dramatic and sometimes humorous footage. The brothers also took photos of the mule riders, as they descended in the Canyon. These clever men were quick to develop and sell them to visitors on their way back out. 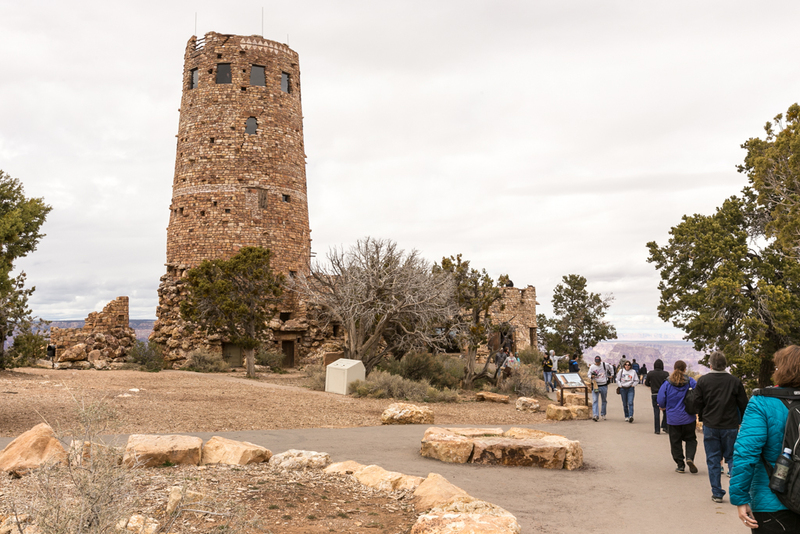 Mary Colter designed the 70-foot tall Watchtower at Desert View, which you can climb for even more astounding vistas. The interior depicts historic Puebloan symbols and legends with petroglyphs, pictographs, and artifacts. 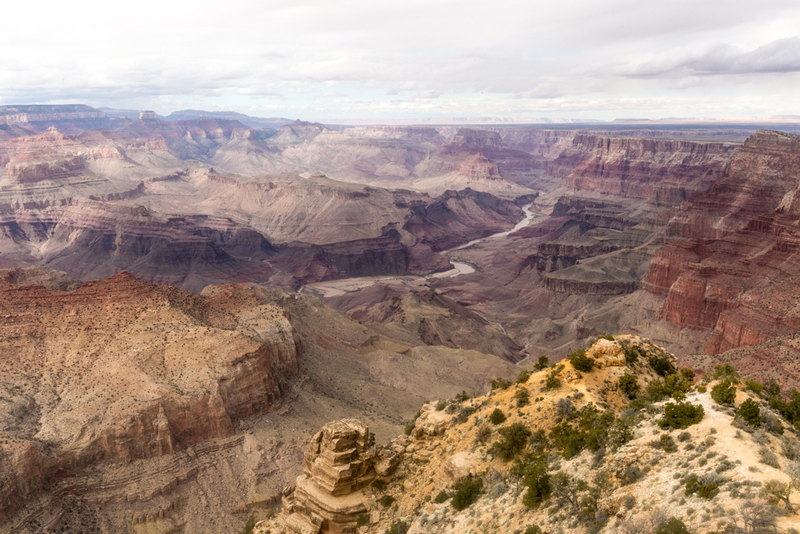 Nearby Lipan Point also offers from spacious views into the abyss. The Hopi House sells Native American handicrafts making it the choice for authentic gifts or souvenirs. Mary Colter also designed the building along with Lookout Studio. Walk there to enjoy views from multi-level porches and see their selection of geological gifts. All the lodges sell typical gift shop items. Free shuttle buses take tourists to the main Visitor Center, where they can watch the National Geographic IMAX movie on the Canyon’s history. Other shuttles run to vantage points like Hermit’s Rest and Yaki Point. Tour buses for ticketed guests take them on short outings or day trips within the park. Hiking in the Canyon is the opposite of most treks – you descend first and must remember that the climb back becomes more difficult. South Rim elevation is 7,000 feet and the average depth of the Canyon is one mile. You can’t appreciate the Canyon’s size until you descend into it. Hiking rim to rim has been the classic claim to fame but requires physical fitness and advance preparation. 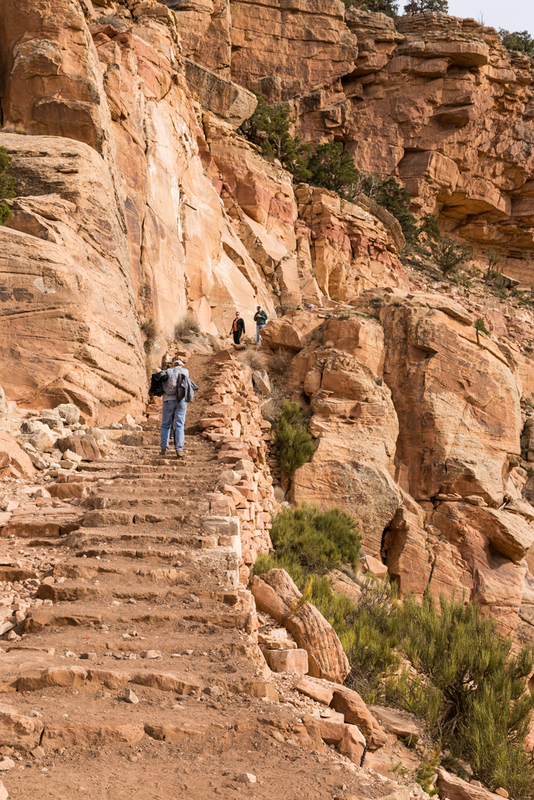 For those not up for that strenuous an outing, but one that is still challenging, try the South Kaibab Trail. The rugged route begins with a series of switchbacks and immerses you within the canyon almost immediately. 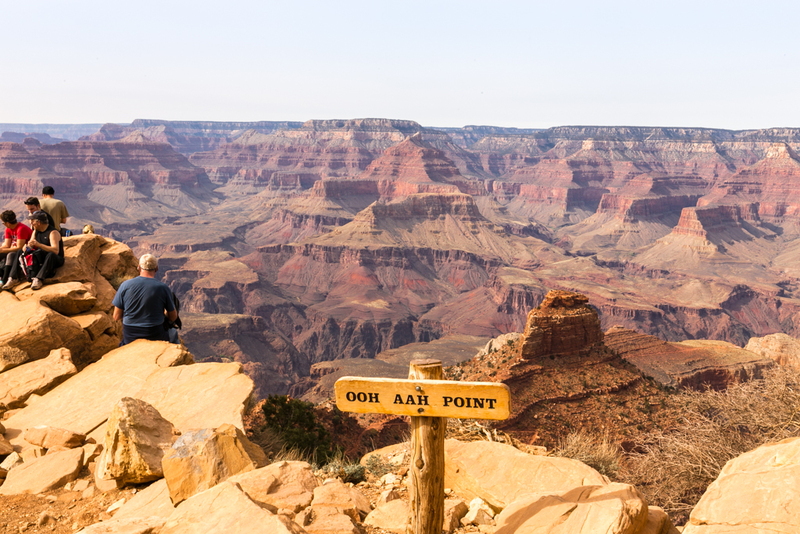 Even if you just go as far as appropriately named Ooh-Aah Point, you will have a thrilling memory. Perhaps you’ll get lucky and have mules saunter by, adding the nostalgia of the old West. Another easy access point, but one that is rather unknown and unmarked, is fabulously wind-carved Shoshone Point. You will need to park or be dropped off in the lot past mile marker 244. A very gentle one mile hike gets you to the lookout point. Carefully walk a bit further out on the rocky ledges and you’ll be blessed with a dramatic, near 380 degree panorama. It’s an absolutely glorious spot that gives a natural high. Inquire with a Ranger to get directions. 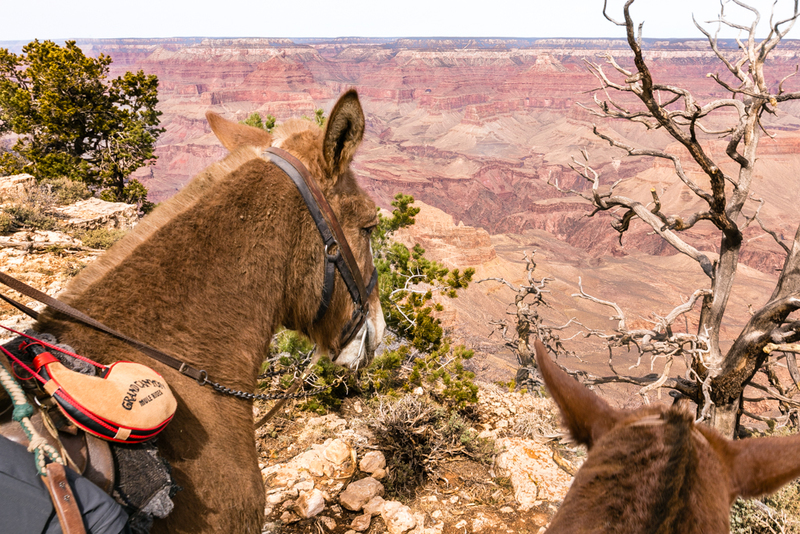 While any view or angle around the chasm is mesmerizing, one from the back of a mule becomes a special treat. 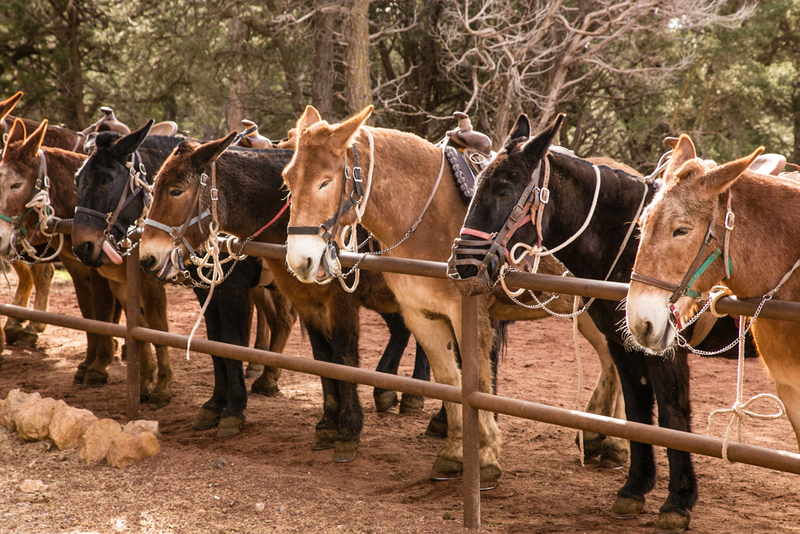 Mules maintain a long tradition for providing the most reliable transport on the trails. They are three times as strong as a horse and more sure-footed. Their eyes are also located on the outside of their heads, a characteristic that allows them to see all four of their feet, something that comes in handy on narrow trails with little margin for error. Odds of nabbing a reservation for the famous mule ride down and back with an overnight stay at Phantom Lodge are slim. Make those plans about a year in advance. But, never fear, Xanterra offers a new, shorter and less difficult tour that leaves twice daily: Vista Rim Ride. Riders start at the historic main barn in Grand Canyon Village and are driven via tour bus to Yaki Barn. 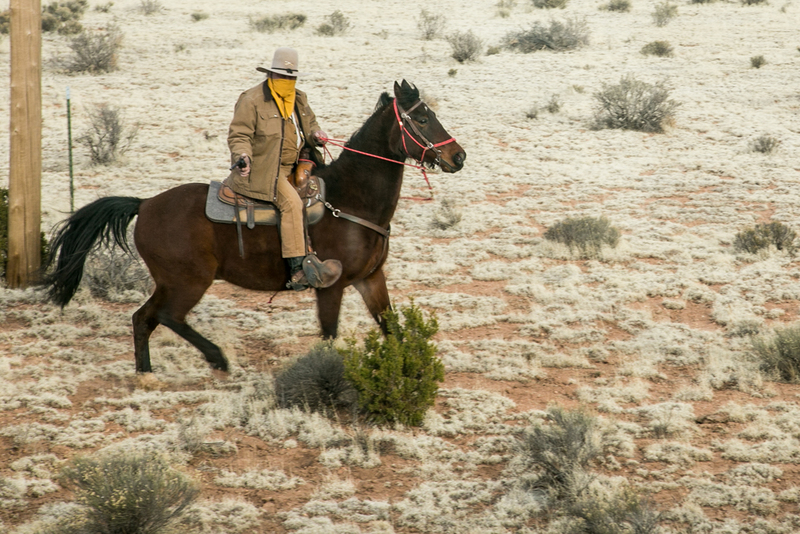 Here they saddle up for a four-mile ride that meanders along the spectacularly scenic East Rim Trail. I had the opportunity to join this memorable escapade and highly recommend it. Let me assure you that I am not an experienced horseback rider, honestly a total amateur. The mules, however, are real pros. They have been very well trained and will follow the mostly flat trail with certainty. The only requirements are that riders weigh less than 225 pounds, cannot be pregnant, stand at least 4 feet, 7 inches tall, speak and understand fluent English, and not be afraid of heights or large animals. An experienced wrangler or guide leads the tour and stops the group several times to provide interpretive information about geologic formations, human history, fire ecology, the Colorado River, the area’s native peoples, and the surrounding forest. During these stops, you can take out your camera and shoot some keepsake photos. 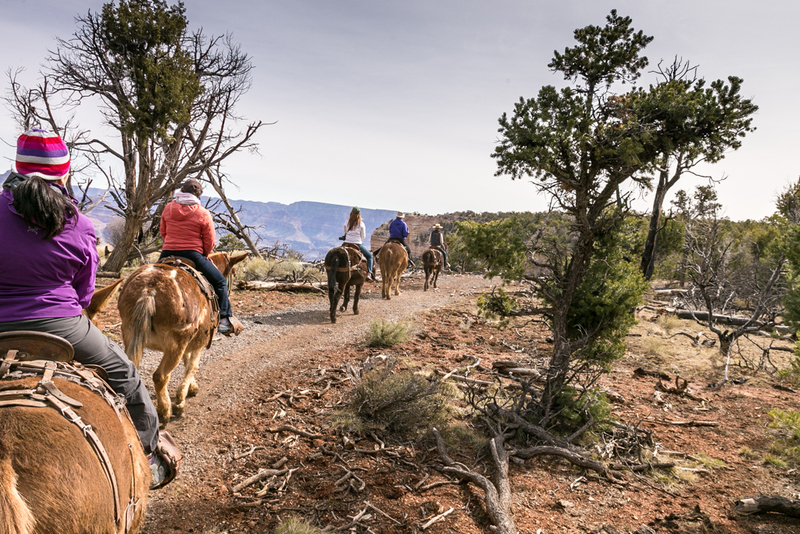 The mule tour covers trails within the Canyon that lie off the well-beaten main path. It seemed like my group of ten riders had the place to ourselves, a rare treat. I have to say this ride was a true highlight of my stay in the Canyon. Aerial tours of the Grand Canyon by small plane or helicopter are offered daily by air tour companies out of the Grand Canyon Airport in Tusayan. See The Guide, the newspaper of Grand Canyon National Park, for more information. Nothing beats a float down the Colorado River but whitewater trips through the Canyon start from Lees Ferry and involve 3-18 days and plenty of advance preparation. Those who left their car in Williams and rode the Grand Canyon Railroad will be delighted with their return trip. They will be served a complimentary glass of champagne before an infamous band on horseback temporarily hold up the train. The robbery is all in good fun and the kids love it. Finish your trip with a second night at the Grand Canyon Railroad Hotel or head on with majestic memories of a truly grand visit. All photos @ Debi Lander. Disclosure: Many thanks to Tom Mesereau of Mesereau Public Relations and Bruce Brossman from Xanterra Parks & Resorts for hosting me during a press trip.Thanks also to all the wonderful Rangers and folks who live and work at the Canyon. NextMississippi Gulf Coast: calling all foodies!